I used the newest peachy keen kit of the month for this card. This dog is kind of a labor of love lol for my dog I paper pierced him. I used chalk for his cute little cheeks and white gel pen for his cute little eyes. I used a wobble to pop him up. For his dog house, I also paper pierced it too. I wanted to make it look white washed, so I used my white gel pen to make it look as close as possible. I used some pop dots on his house! What a cute, cute card! Love the pink doghouse! Hi Denise. What a cute card!!! Love the colours and simple style. Thankyou for joining in the fun at FSC this fortnight. 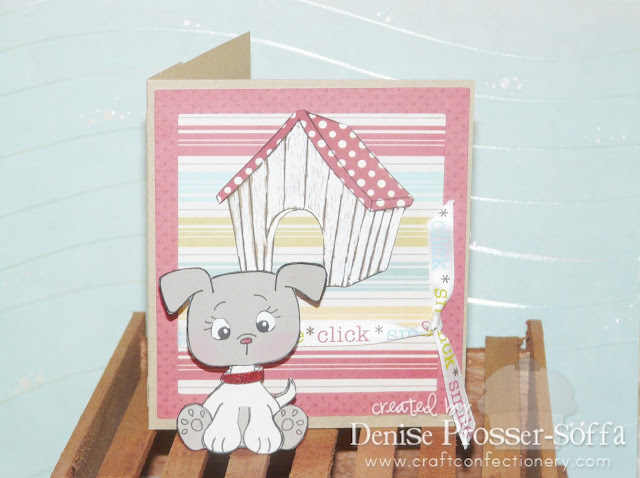 This is a cute card and I like the way you popped you puppy up to give this card dimension.